The tobacco plant was brought to Europe from the New World during the early sixteenth century, and by the middle of the nineteenth century, it was a major Dutch crop. In 1879, Adolf Mayer was asked investigate a disease in Holland that stunted the growth of the tobacco plant and mottled its leaves; he reproduced the condition (which he called tobacco mosaic disease—TMD) in healthy plants by rubbing them with the sap from infected ones. About a decade later, Dmitri Ivanovsky investigated this same plant disease in Ukraine and Crimea and, in 1892, reported that the cause of TMD was able to pass through a fine porcelain filter that traps bacteria. Martinus Beijerinck, a Dutch microbiologist, repeated Ivanovsky’s study, also finding that whatever caused TMD passed through the porcelain filter, and in 1898 he concluded that it was smaller than a bacterium. But, while capable of reproducing in living plants (unlike bacteria), it was unable to grow in culture media; he called it a virus (Latin for “poison”). During the first three decades of the twentieth century, researchers were able to grow viruses in suspensions of animal tissues, and then, in 1931, in fertilized chicken eggs, which proved invaluable for research and vaccine production. The structure and chemistry of viruses were next studied. In 1931, the newly invented electron microscope by Ernst Ruska and Max Knoll made it possible for them to actually create images of a virus. Four years later, the American biochemist Wendell Stanley crystallized and described the molecular structure of the tobacco mosaic virus (TMV), the first virus ever to be discovered. He was a co-recipient of the 1946 Nobel Prize in chemistry for this achievement. Stanley found that viruses share the properties of living and nonliving matter: When not in contact with living cells, they are dormant—no more than a large chemical. Viruses are nucleic acids (DNA or RNA) surrounded by a protein coat. However, when in contact with an appropriate living plant or animal cell, they become active and reproduce. In short, they reside in a gray area between lifeforms and chemicals. SEE ALSO: Tobacco (1611), Deoxyribonucleic Acid (DNA) (1869), Tissue Culture (1902), Bacteriophages (1917), Electron Microscope (1931). The tobacco mosaic virus (TMV) was the first virus ever discovered. 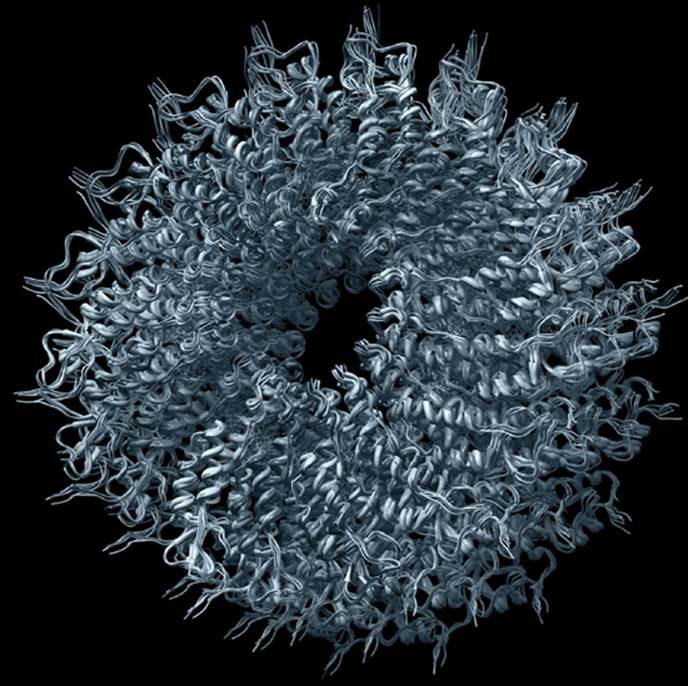 The image depicts the TMV capsid, the protein shell of the virus that surrounds its core of genetic material.